You are here: Home / Ent. / Call Of Duty: Mobile Revealed. 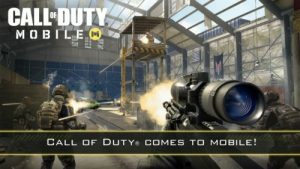 Call Of Duty: Mobile Revealed. Cautionary Note Regarding Forward-looking Statements: Information in this press release that involves Activision Publishing’s expectations, plans, intentions or strategies regarding the future, including statements about the expected availability, features, functionality, events and content for Call of Duty: Mobile, are forward-looking statements that are not facts and involve a number of risks and uncertainties. Factors that could cause Activision Publishing’s actual future results to differ materially from those expressed in the forward-looking statements set forth in this release include unanticipated product delays and other factors identified in the risk factors sections of Activision Blizzard’s most recent annual report on Form 10K and any subsequent quarterly reports on Form 10-Q. The forward-looking statements in this release are based upon information available to Activision Publishing and Activision Blizzard as of the date of this release, and neither Activision Publishing nor Activision Blizzard assumes any obligation to update any such forward-looking statements. Forward-looking statements believed to be true when made may ultimately prove to be incorrect. These statements are not guarantees of the future performance of Activision Publishing or Activision Blizzard and are subject to risks, uncertainties and other factors, some of which are beyond its control and may cause actual results to differ materially from current expectations. ACTIVISION, CALL OF DUTY, CALL OF DUTY BLACK OPS and CALL OF DUTY MODERN WARFARE are trademarks of Activision Publishing, Inc. All other trademarks and trade names are the properties of their respective owners.